Our meeting this evening was an extra meeting, held in the Whyte Room, upstairs at the Ripley Centre. Whilst not having the imposing grandeur of the Music Room, it was still a pleasant, cosy venue. Annelise was excellent in the Hospitality role. She arrived early, ready to usher members and visitors upstairs. Then our Sergeant at Arms, Christine, arrived to set up the room and bring us some delicious biscuits. The club’s ribbons were displayed with care and everything laid out well. Soon afterwards Christine opened the meeting and then handed over to our President, Paul Andreas. Paul told us a story about Craig Valentine, the 1999 World Champion Speaker, who on his way home from winning the International contest stopped at a bookshop to buy a book about Public Speaking, so that he could continue to improve. Paul then shared three books that he has read recently and recommends. These are, “World Class Speaking” by Craig Valentine, “The Speaker’s Toolbox” by Brian Woolf and “Talk Like Ted” by Carmine Gallo. Paul then left us with three words of encouragement – ABI, which stands for “Always Be Improving”. Our Toastmaster for the evening was Jenny Taggart. Her relaxed attitude matched our more relaxed surroundings and she brought much humour into the proceedings. She introduced our Timekeeper, Paul Lynch, who explained his role and then proceeded to keep us to time, which he achieved, and the meeting ended ten minutes early! The Warm Up, given by Vitu, was to answer the question: “What advice would you give yourself when you were ten years old?” There were some interesting answers including a callback to Paul’s ABI “Always be improving”. Adam followed with his Icebreaker speech, “My First Match”. This told us of his excitement at going to watch Newcastle United play Derby with his dad. He used some very eloquent language to describe the match. For example, he compared the black and white striped jerseys of the supporters to a migrating herd of zebras. New member, Ritu, then entertained us with her Icebreaker speech titled “Seasons’ Greetings”. ‘Seasons Greetings’ is also the meaning of Ritu’s name. We were greeted in the different languages she speaks. Her theme was about embracing change and we were told of some of her experiences in India before she came to this country last year. As an advocate for change, she currently works at helping young people improve their confidence and communication skills. Margot got us thinking about our lifestyles with Speech # 3 from the CC Manual. She encouraged us to avoid chemicals in food, household products, cosmetics, tobacco and to exercise for 30 minutes a day, five times a week to maintain mental health in old age. The three speeches were then evaluated by John C, Jennifer A and Richard M.
During the break we were able to enjoy our drinks and biccies in the comfort of easy chairs and a sofa. Curtis led the Table Topics with some interesting questions such as ‘How would you define success?’, ‘ What did you learn last year?’ and ensured that everyone who wanted to give a talk was able to. Recognition was given to Paul L who won the Table Topics award for telling us about the only time that he remembers getting angry. Richard M won the Best Evaluation Award for his evaluation of Margot’s speech and Margot won the Best Speaker Award. Our President presented an “Icebreaker Ribbon” to Adam and Ritu for completing their Icebreaker speeches. Our General Evaluator for the evening was Tony Smith. Doing the role for the first time, Tony brought some insightful and useful comments. Richard Murray, Chair of the Nominations Committee, then gave a report of who is standing for the Club Committee. The elections will be held next week. Anyone who hasn’t put their name forward yet, can do so on the night. Paul A then drew the meeting to a close with a reminder to come to the District Conference on 5-7 May. This will be an opportunity to hear some of the best speakers in the South East and attend some great workshops. There is also the Gala Dinner on the Saturday evening. Our two guests, Alexis and Chi, joined this evening, taking our numbers up to 50. That is great because it shows that we have a vibrant club that people want to join. However, it is now time to cap our numbers and create a waiting list, otherwise there will not be enough speaking slots for our members. Our District Conference at Southampton is 5-7 May. Come along for all or part of it, if you can, and support Samir Malak who will be competing in the Evaluation Contest on the Sunday. Club Elections on Thursday 4 May. Division Contest at Southampton on 6-7 May. NB Extra meeting at The Shortlands Tavern on 25 May 2017. Sign up for a role before they all go. Paul Goodhill arrived early and was very helpful in taking on the hospitality role for which no one had signed up for. Our meeting was opened by our Sergeant at Arms, Paul Lynch, who did a great job of introducing the meeting and reconvening it on time. Paul then handed over to our President, Paul Andreas. Paul welcomed the guests and reminded us all about the upcoming Division Contest on Saturday 22 April and the District Conference in Southampton on 6-7 May and encouraged members to come along to them. He then reminded us about our Club Committee elections, to be held on Thursday 4 May, which are a great opportunity to learn more leadership skills and to perform one of the tasks necessary for the ALB Award. Our Toastmaster for the evening was Jenny Andreas, who told us that the theme of the evening was going to be “Goals”. (Dreams with deadlines.) She encouraged us all to remember to get evaluated for roles and to have it dated at the back of the Competent Leader Manual. She introduced her team. Paul Goodhill, returning from an unusually cold holiday in Turkey, was Timekeeper. Alain did a meticulous job as Ah Counter. Alexanderz, stepping into the breach at the last moment, did a great job as Grammarian encouraging everyone to use the word “Achieve”. In her Warm Up, Margot got members talking and singing about music that made them happy. Our first speech was titled “TEAM” by Annelise, which was all about Team Building. As an ex-president of “Experience French” this is a subject that Annelise has some experience of and her speech was very timely, as we are in the process of nominating a new leadership team to the Club Committee. Christine then followed with Speech # 3 from the CC Manual, titled “Some Mothers Do ‘Ave ‘Em”. This was a very entertaining speech about how Christine suffers from dyspraxia which affects her co-ordination. This makes for an eventful time when her family are all at home, bumping into each other. Our third speech was by Alex C, presenting Speech # 2 from the Entertaining Speaker Manual called, “Philip Larkin Was Wrong”. Alex gave us some entertaining reflections about one of Philip Larkin’s poems and was able to move away from the lectern and use hand gestures! The three speeches were then evaluated by David Hampton, Richard M and Paul A. After the break Simon led the Table Topics with some interesting questions about setting goals. Recognition was given to Adam who won the Table Topics award for telling us how his goal to set up his own business led to a prestigious job in the video making industry. David Hampton won the Best Evaluation Award with his useful tips on dealing with stress when evaluating Annelise’s speech. Christine won the Best Speaker Award for her moving, personal story that engaged us with her sincerity and humour. Well done, Adam. He only joined us a few weeks ago and he’s winning awards already. Our General Evaluator for the evening was Neil Pettigrew, who gave us some insightful feedback. Neil gave a speech a few weeks ago about the importance of learning leadership skills at the club and completing the “Competent Leader” Manual. This evening Neil attained the CL Award by completing the GE Role, Congratulations Neil! Paul A then drew the meeting to a close with another reminder about the District Conference. This will be an opportunity to hear some of the best speakers in the South East and attend some great workshops and the Gala Dinner on the Saturday evening. A big thank you to all those who took on roles and gave speeches and helped to make the evening a great success. Welcome to new member, Fran, who has just joined us. The winner of the Division Contest Evaluations on 22 April was Samir Malak, our previous Area Director, and now a member of Clapham Connectors. He will be representing our Division at the District Conference at Southampton on Sunday 7 May. Our next club meeting will be held on Thursday 27 April in the Whyte Room at Ripley Arts Centre. There are still roles available, which you can book up through Easyspeak. Our Sargent at Arms Neil, ensured that the room and our members were ready for lift off at 7.30pm. Club President Paul A, warmly welcomed everyone. For the benefit of members not present at the previous meeting, he mentioned changes that the club have put into place because of the large membership. The changes follow. Evaluators are not being invited to read out assignment objectives prior to speeches being delivered. These are already printed on the agenda so are easily visible by everyone. The Hot Tip has been cut out of normal meetings. Warm up responses are being restricted to ten seconds. Our Toastmaster for the evening was the popular Richard Green who always leads with energy and enthusiasm. He had words of support for everyone. Dave H was in charge of the warm up. His question was, “which famous person, past or present, would you like to invite to dinner?” Responses ranged from the practical such as Paul Hollywood and Jamie Oliver, (so that they could do the cooking), to world leaders such as Nelson Mandela and Winston Churchill. As usual, there was a very varied selection of subjects for the set assignments. Both Georgina and John C were presenting their CC10. The purpose of this assignment is to inspire your audience. Georgina with her speech ‘WHY’, shared lots of tips and advice on time management to allow us to achieve our goals and focus on what we want to do. John C’s speech titled ‘Refugees – the lives we can save,’ was a very moving account of refugees and people that have made a difference to their plight. It is very noticeable how both speakers have developed during their time at the club and we now look forward to them moving on to the Advanced Manuals. Well done guys. Our last speech, from Curtis, was his CC6 (vocal variety). The intriguing title was, ’What is that in the corner?’ He then explained his research in finding out more about a mystery object. There were good changes of pace and pauses during the tale to add to the suspense. To find out more, ask Curtis at our next meeting. The three speeches were expertly evaluated by David W, Paul L and Tony, with lots of commendations, useful feedback and interesting insights. Paul L reminded us to use prior learnings such as vocal variety and gestures when we tackle more advanced projects i.e. assignments should be seen as building blocks rather than one off projects. In the second half, Karen gave a very slick and confident performance as Table Topics Master. She had a great selection of subjects pitched at the right level, which brought good responses and a lot of humour. Some of the respondent’s word pictures were very memorable, especially Jenny T, which demonstrated the power of language and the imagination. Jenny A managed the tough task of evaluating eleven mini speeches at her first time in the role. She gave lots of praise and offered a number of suggestions for improvement. Also tackling roles for the first time were Adam (timekeeper), John V (Grammarian), and our newest member, Ritu (Ah Counter). All of them had prepared well for their roles and gave very good reports. Taking on these roles or acting as an evaluator certainly keeps you on your toes and hones your active listening skills. The timekeeper’s role is essential as it helps everyone to keep on track and avoid stealing time from other contributors. If you are not sure about taking on this role for the first time, you can always ask for an experienced member to help you on the night. John V’s word for the day was ‘Grateful’. It seemed apt, because at the start of the meeting, our Club President had invited Neil P and Georgina to explain their roles on the committee. He encouraged all members to consider stepping up for roles to the new committee. We should all feel grateful for the work the committee does behind the scenes ensuring that Bromley Speakers continues to thrive. Thank you, thank you, thank you. The nominations Committee consists of Richard M, Annelise and Paul A. If you would like to serve on the new Committee from 1 July then please talk to one of them. They will be speaking to members to see who would like to serve and reporting the results at the Club Meeting on 27 April. The elections will be held at the following club meeting on 4 May, when there will also be an opportunity to take nominations from the floor. The new committee will take office at our annual dinner at the Bickley Manor hotel on 6 July. Put this date in your diaries. The venue is idyllic, the food is delicious and the company is superb! At the end of the evening, General Evaluator Sue S congratulated everyone on an entertaining and educational evening. The next meeting is on 20 April at 7.30pm at the Ripley Arts Centre. 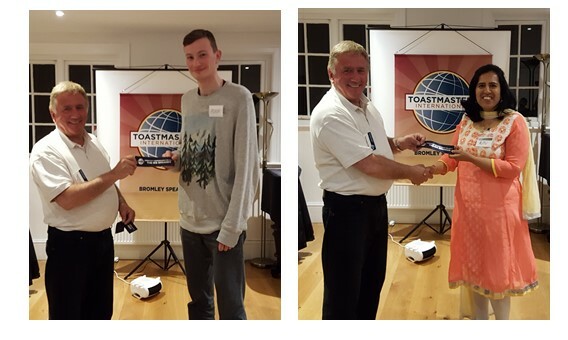 Awards on the night went to, Bryony (Best Table Topic), Paul L (Best Evaluator) and John C (Best Speaker). After the meeting a number of the members continued discussions at the local hostelry. Extra meeting to be held at the Whyte Room, Ripley Arts Centre on 27 April. The Nominations Committee will report to the Club. Elections will be held on 4 May. Extra meeting in the Function Room, Shortlands Tavern on 25 May. Annual Dinner and handover to the new Committee on Thursday 6 July. Jenny T, acting as Sergeant at Arms, kicked off proceedings on time and handed over to Club President, Paul A.
Paul started by sharing the club vision, from the CC Manual, which is “to provide a mutually supportive and positive learning environment, in which every individual member has the opportunity to develop oral communication and leadership skills, which in turn foster self-confidence and personal growth”. · The Evaluator will no longer share the speech objectives because this information is on the Agenda anyway. This should create time for more Table Topics or a fourth prepared speech. In addition the membership will be capped at fifty and a waiting list created to limit the demand for available speaking slots. Paul also shared that the Committee was considering holding extra meetings in a local pub, perhaps on the fourth Thursday of the month, to create more speaking slots. So, he asked the members if they would like extra meetings and whether they would prefer Monday or Thursday evenings. Paul then handed over to the Toastmaster of the evening, the very experienced and professional Richard Murray, a Past President and Distinguished Toastmaster. We were then treated to three well-crafted speeches. First Riya presented her CC6 titled ‘Which one are you?’, a very interesting speech questioning how one reacts to circumstances, using the example of the effect of boiling water, on an egg, potato and coffee bean. Next up was Alex with his first speech from the Entertaining Speaker manual. It was called ‘The day I met Michael Jackson’, and he had. Wow! All that was missing was some moon walking. Finally Martin A did his CC1 ‘A chance meeting’. It was a confident performance, especially as this was his first Toastmasters assignment. His story took us on his journey from BT sales, to scuba diving teacher, actor and family man. The speeches were well evaluated by Karen, Paul L and Jenny A, with great observations and suggestions by them all. In the second half Neil was in charge of Table Topics. He gave a clear, succinct explanation of Table Topics and was able to fit in eleven respondents. Subjects included beards, art galleries, the twentieth century, nuisance phone calls, legs and the colour green. Sue as Table Topics evaluator had the challenge of giving commendations and recommendations to everyone within the set time. Also helping out were Dave, John and Margot. Dave was our Timer and displayed an innovative approach to showing the timing lights and demonstrating the ‘out of time’ sounds on his phone, when he explained his role at the start of the meeting. No wonder he is the “go to man” for anything technical. Ah counter, John V, not only gave individuals their totals but also had added up the number for the whole meeting. Maybe a name to put forward as the next club Treasurer! Margot, our Grammarian, chose “Invigorate” as the word for the day and provided a clear explanation of its meaning. She also highlighted interesting vocabulary and clever phraseology such as ‘homeless or hipster’, ‘moths to the flame’. John Cross was our General Evaluator and was doing the role for the first time. He was upbeat, concise, to the point and gave us plenty of commendations and some recommendations. At the end of the evening, Paul A presented awards to Martin A (best speaker), Dave (best table topic) and Paul L (best evaluator). Paul then announced that the Nominations Committee will consist of himself, Annelise and the Chair, Richard M, and encouraged people to stand for the Club Committee. Jenny T then described some of the tasks that she does as Treasurer and encouraged members to stand for the role. Paul then reminded everyone about the Club’s Annual Dinner on 6 July, where the handover to the new Committee will take place. The meeting was then reconvened to the Anglesey Arms where plenty more informal speeches were made. Thursday 27 April – Extra Club Meeting in The White Room, Ripley Arts Centre. Thursday 25 May – Extra Club Meeting in Function Room, Shortlands Tavern.